This is great news on several fronts, but especially for supporters of limited government and regulatory restraint (such as me), who’ve often viewed the EPA as an arrogant, tyrannical, and arguably unconstitutional agency. A divided Supreme Court on Tuesday abruptly halted President Obama’s controversial new power plant regulations, dealing a blow to the administration’s sweeping plan to address global warming. In a 5-4 decision, the court halted enforcement of the plan until after legal challenges are resolved. By temporarily freezing the rule the high court’s order signals that opponents have made a strong argument against the plan. A federal appeals court last month refused to put it on hold. The court’s four liberal justices said they would have denied the request. Centralize everything in DC’s hands, if you want to achieve perfect mediocrity. As we get deeper into an election season, many politicians feel compelled to discuss how to deal with poverty. And some of them may even be serious about trying to improve the system. This hopefully will lead to big-picture discussions of key issues, such as why the poverty rate stopped falling in the mid-1960s. If so, it helps to look past the headline numbers and actually understand the scope of the problem. Nicholas Eberstadt of the American Enterprise Institute explains that the official poverty data from the Census Bureau overstates the number of poor people. Via Prager University, Princeton University Professor of Jurisprudence Robert George looks at several reasons for the decline of liberty in America — from the growth of the national government particularly since the New Deal, to the growing willingness of the courts to “legislate from the bench” and the acquiescence and even collusion of the other two branches in that– and identifies one key reason: citizens’ own ignorance of our founding documents. Competition among the states as a check on the greed and foolishness of progressives, with Vermont as an example. I’m a big fan of federalism for both policy and political reasons. Returning programs to the states is the best way of dealing with counterproductive income-redistribution policies such as welfare, Medicaid, and food stamps. Federalism is also the right way of unwinding bad education schemes like Obama’s Common Core and Bush’s No Bureaucrat Left Behind. And the same principle applies for transportation, natural disasters, and social issues such as drugs. And I can’t resist pointing out, for the benefit of those who think such things matter, that federalism is also the system that is consistent with our Constitution’s restrictions on central government power. Instead of a Government-Guaranteed Income, How About a Practical Plan to End the Washington Welfare State? Hmmm… Block-granting the entire welfare state to the states to allocate as they need, then gradually eliminating it — a federalist approach. I like it. The welfare state is a nightmare. Programs such as Medicaid are fiscal catastrophes. The food stamp program is riddled with waste. The EITC is easily defrauded, even sending checks to prisoners. And housing subsidies are a recipe for the worst forms of social engineering. The entire system should be tossed in the trash. But what’s the alternative? Some libertarians argue that we should eliminate the dozens of Washington programs and replace them with a government-guaranteed minimum income. I address this issue in an essay for Libertarianism.org. In the wake of the presidential election earlier this month, a lot of people expressed their disappointment with the results by submitting petitions for secession at the White House web site. Petitions were received from all 50 states, and there were several counter-petitions from progressives urging the government to let them go. To be honest, and even though I signed South Carolina’s to support my friend Gay Patriot, I looked at these as just blowing off steam after a disappointing election loss, just as liberals fantasized about secession in 2004. I didn’t and don’t take them seriously. My mistake, in at least one respect. As Prof. Glenn Reynolds points out in an op-ed in USA Today, petitions such as these and more serious secession movements in Scotland, Catalonia, and elsewhere arise from anger at a central government from which they feel alienated for various reasons. While the petitions themselves may not be serious, the resentment and irritation caused by being forced to obey one-size-fits-all laws you hate is very real. And, if left to fester, it can lead to more serious problems. So what’s a solution? Let the central government do the things that only central governments can do — national defense, regulation of trade to keep the provinces from engaging in economic warfare with one another, protection of basic civil rights — and then let the provinces go their own way in most other issues. Don’t like the way things are run where you are? Move to a province that’s more to your taste. Meanwhile, approaches that work in individual provinces can, after some experimentation, be adopted by the central government, thus lowering the risk of adopting untested policies at the national level. You get the benefits of secession without seceding. Surely Reynolds wrote this with a wink and a smile, for federalism is the way were are supposed to operate, and our problems have grown as the federal government has usurped more and more of the states’ proper role, turning gradually from a government of limited powers to Leviathan. Consider it another way: the more the federal government tries to do everything, the less it can do anything well. The national economy and health care systems are too large and too diverse, and there’s too much information coming in, for them to be directed top-down by a few hundred (or even a few thousand) pols and bureaucrats in D.C. The needs of people differ in various parts of the country, and the resources needed to even try to manage everything nationally wind up being diverted from those things only the federal government can do well, such as national security. The solution, as Reynolds writes, is to recognize those spheres of competence and respect them, something that’s happened less and less since the progressive era. This isn’t to say that the enumerated powers of Article 1, Section 8 are the end all and be all; the Founders themselves recognized that the Constitution would sometimes need amending (2) –including granting the federal government more power– and put in place procedures for doing just that. It’s through ignoring those limits and procedures that we’ve reached a point whereat so many think, with some justification, that the United States Government is becoming a threat to their liberty and prosperity. Change won’t be easy, and the genie of the progressive administrative state probably can’t ever be wholly put back in the bottle. But for the health of our body politic we have to keep trying. (1) Also “states’ rights,” but that term was forever tainted thanks to defenders of slavery and Jim Crow hiding behind it, back in the day. 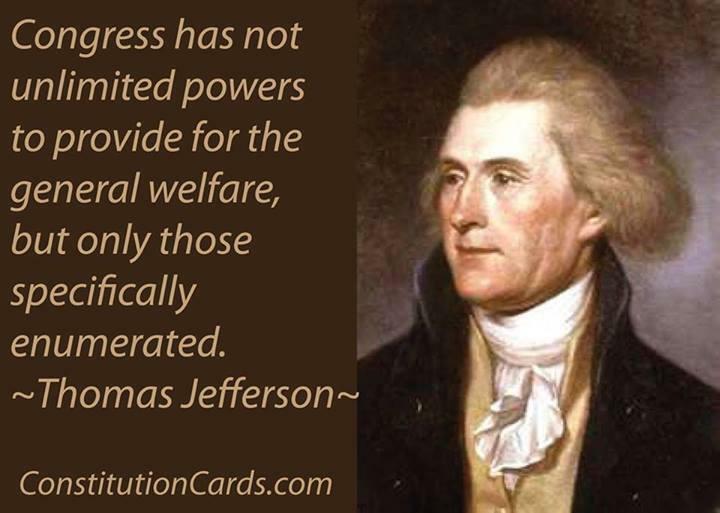 (2) And I do think several are needed to deal with the progressive-statist tendency to grab more and more power. Professor Randy Barnett’s Bill of Federalism is a great starting point for discussion. Oddly enough, in the wake of their defeat in 2004, progressives themselves were arguing for federalism. Bipartisanship!